This is a guide for the best Loadout for the Smart Pistol Mk5 in Titanfall 2014. The Smart Pistol MK5 is mainly designed to take out enemy minions, that is Grunts and Spectors. It will automatically lock onto them and take them out when you pull the trigger. Taking out enemy Pilots is very tricky, however, and should be done by firing from the hip. The loadout is focused on staying hidden and finding enemy minions. Using the suppressor attachment to the Smart Pistol MK5 will let you take out minions close to enemies without appearing on the map. Chose the Cloack Tactical Ability to stay hidden from enemy Titans and possibly Pilots, although close up you are still easy to spot. For the Ordnance take the Arc Grenade which distorts the vision of enemies letting you take them out eaisly or make an escape. For the Kit chose the Run N Gun Kit alllowing you to run whilst shooting making you harder to hit and escape easier. The Minion Detector shows enemy minions on the map allowing you to find them easily. The Mag Launcher is the best Anti-Titan WEAPON since you can fire it from out of sight of enemy Titans. Chose you favorite sidearm to use when you are out of bullets in the Smart Pistol MK5’s clip. 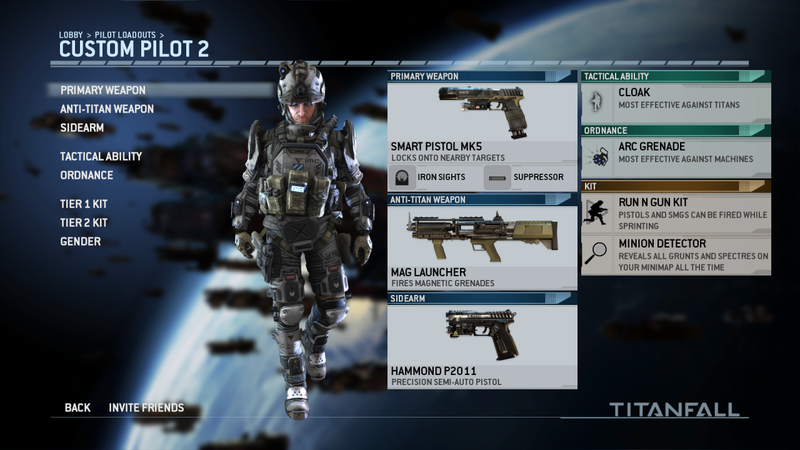 This entry was posted in Pilot Guides, Titanfall and tagged 2014, auluftwaffles, Best SMART PISTOL Loadout, BEST SMART PISTOL Loadout Titanfall, Best SMART PISTOL MK5 Loadout, game guide, Games, gaming, guide, SMART PISTOL MK5, Titanfall, Titanfall Guide, Video Game Guide, Video Games. Bookmark the permalink.